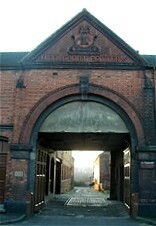 Established in 1851, Burgess Dorling & Leigh is one of the few pottery firms still being run under family ownership. Steeped in Staffordshire's Pottery history, this fine old business has been manufacturing best quality, pure English pottery for over 150 yrs. The name Burleigh Ware is renowned the World over and is associated with fine craftsmanship and a traditional manufacturing process of the highest standard. This whimsical pattern originally called Chinese Peacock was inspired by the old Oriental fable of the Birds Congress to elect a King. Perfection in colour decoration and form. The Bluebird pattern has been in continuous production since the founding of the Company in 1851. 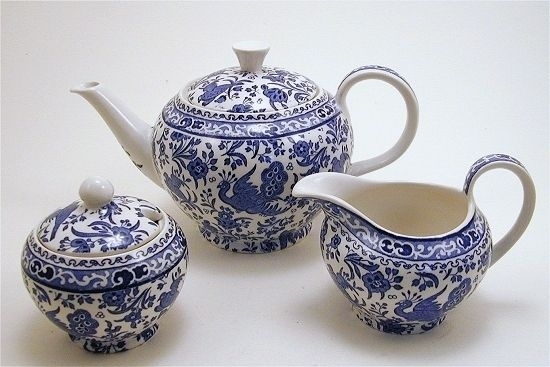 This set was made for us which we appreciate as Bluebird Teapots are not part of Burleighs normal production. We waited 6 months to take delivery and we are delighted with the results. It is a wonderful pattern and makes a beautiful and unusual set. We hope to have matching cups and saucers available shortly. A smaller Blubird Teapot with matching mug as shown in large photo. A beautiful rather bold calico pattern called Arden. Shades of Cobalt blue make this set a wonderful addition to any table. It has a higher contrast in its apttern than Bluebird with a simpler design. Teapot holds 16 ounces with a matching mug as shown in larger photo. Please note the handle which has a different look but is extremely confortable to use.